The Czech Republic is the least healthy country in the world, according to new research conducted by Clinic Compare. The clinic comparison website gathered their data from the World Health Organisation by analyzing alcoholic consumption, tobacco consumption and the prevalence of obesity in 179 countries around the world. According to the research, the residents of the Czech Republic hit it pretty hard, emerging as some of the world’s biggest boozers. Each individual reportedly consumes 13.7 litres of alcohol per annum, that’s 550 shots – so 1.5 shots a day. Czechs also ranked 11th highest for tobacco consumption. Russia came second, followed by Slovenia, Belarus, Slovakia and Hungary. Eastern Europe came out as the unhealthiest region in the world, occupying nine out of the top 10 spots. The one exception was the US, which ranked 10th in joint place with Lithuania. As for the world’s fattest region, it’s Oceania, with 41 per cent of the population in Samoa having a BMI over 30. Fiji, Tonga, Tuvalu and Kiribati were also included in the top 10 list for obesity. 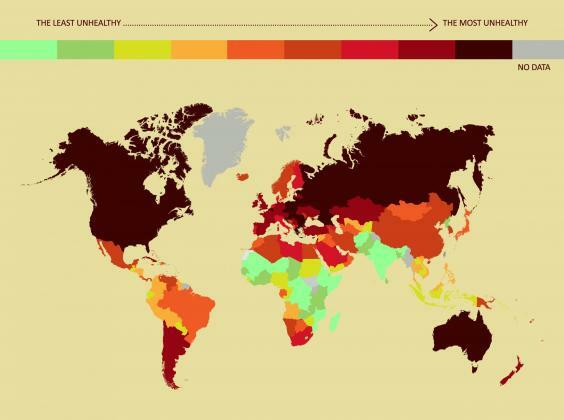 The healthiest country was Afghanistan, boasting the second lowest rate of obesity in the world. Just 2.7 per cent of the population had a BMI over 30.